Remember that scene from Friends where Chandler finds Monica’s secret closet? Monica, the lovable neat freak that she was, was hiding a treasure trove of junk behind her closet door. Does this scenario sound familiar? Maybe you’re not exactly a hoarder. But maybe you could use a few helpful tips to be more like the Monica Chandler you thought you knew! 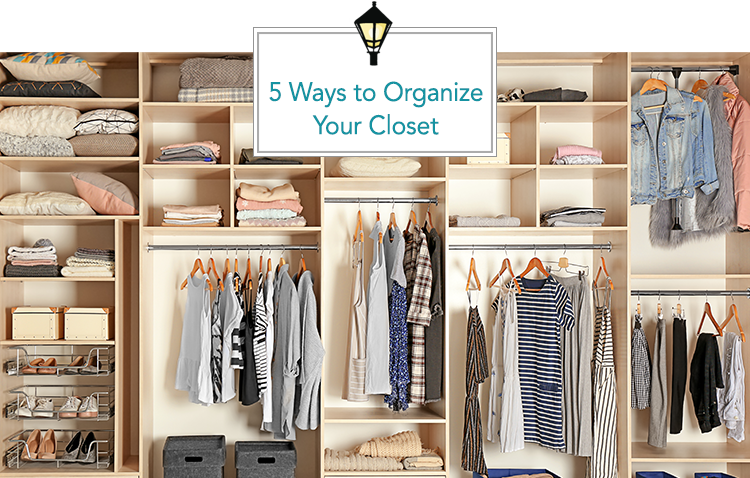 So, let’s look at a few simple ways to organize a messy closet. Have you ever really looked at your shelves? A lot of times, there’s a ton of wasted space; both above and below. We’ve seen this is the case in the kitchen and in our closets as well. If your shelves have adequate space underneath, take advantage of it! One of the best ways to do that is with an “under the shelf” basket like this. This extra space is perfect for socks, underwear and other small items. Under the shelf is a top-shelf idea! While you can make some efficient changes, you only have the space you have at the end of the day. That probably means that you can only go up and down. Luckily, a simple hack is accomplished through the tab on your cokes. Simply place the tab from a coke can over the hanger and hang another one from it. Voila! You now have two hangers for the space of one. And yes, we know a ton of soda isn’t great for you. But let’s be honest, it’s a tasty splurge every now and then. When you do, make that splurge, hold on to your tabs and say hello to extra storage. Speaking of hangers… If you’re like me, you never have enough hangers. One of the simplest hacks to closet organization is just buying more hangers. An extra tip is to color-coordinate your hangers. For example, you can use different colors for different seasons or styles of clothing. Like we said, outside of tearing down walls and redesigning, your space is what it is. Even in the smallest of spaces, however, there are ways to utilize every inch of it. An easy solution is always the backside of your doors. You can always use over the door organizers or less bulky hooks like these. Your next spot to look is your walls. You may have some open wall space to the left and right that you can use. This is the perfect spot to place a hook that can hang scarves, jackets, etc. Our last tip doesn’t require to actually buy anything (except for trash bags). When it comes time to evaluate your closet, that’s the perfect time to purge what you don’t need/wear. Try this: turn your hangers backward and if that item is still facing the wrong way after a certain amount of time, get rid of it! You’d be surprised at how much space you can create by a quick, simple purge. We know it’s hard, but it’s worth the pain! Even better, you can donate your discarded items to our partners at the New Orleans Mission. It’s a win-win! We’re local. We’re global. As an affiliate of Leading Real Estate Companies of the World® and Luxury Portfolio International®, GARDNER REALTORS has connections to the very best real estate brokers who are experts inside and outside your house!